This getting started guide for Debenu PDF Tools is designed to give you a brief overview of the product and it’s main features. If there are any topics that aren’t covered in this getting started guide but you think should be, please let us know. To install Debenu PDF Tools you will first need to download the installer and save the executable file to a location on your computer. After the download process has finished, double-click on the debenu_pdf_tools_en.exefile and the installation process will begin. However, there are shortcuts to Debenu PDF Tools added to your start menu and desktop for quick access. 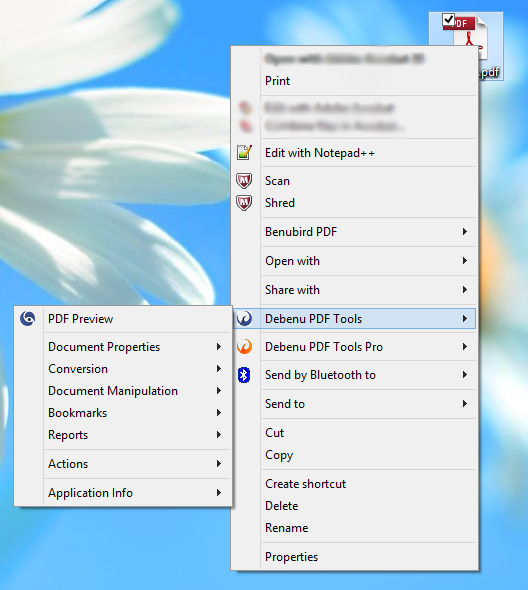 Debenu PDF Tools can be used in four different ways: as a utility accessible from the context-menu (otherwise known as the shell menu) in Windows Explorer, as a PDF viewer and editor, as a batch processing tool and as an automation tool via Watched Folders. To begin with, lets take a look at the functionality offered through the right-click menu in Windows Explorer. Right-click on a PDF and select the ‘Debenu PDF Tools’ from the menu to see all of the available features that can be used to processed the selected PDF file(s). Unlike other applications where you have to choose the feature you want to use first and then choose the PDFs you want to work with, Debenu PDF Tools lets you choose the PDFs first and then choose which action you wish to perform. 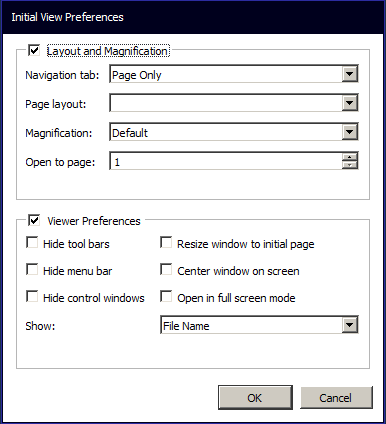 Prior to version 3 of Debenu PDF Tools it was only possible to process PDF files via the right-click menu in Windows Explorer. But with the release of version 3 we added a great new PDF viewer that lets you quickly view PDF files and also manipulate them using great features such as edit document properties, convert to image, split PDF files and more. The PDF viewer has also been optimized for touch screens so it makes for a great user experience on Windows Desktops and Tablets. 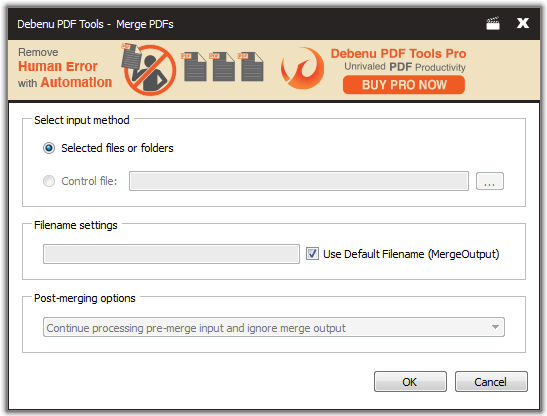 Version 3 of Debenu PDF Tools also got a powerful new batch processing feature. 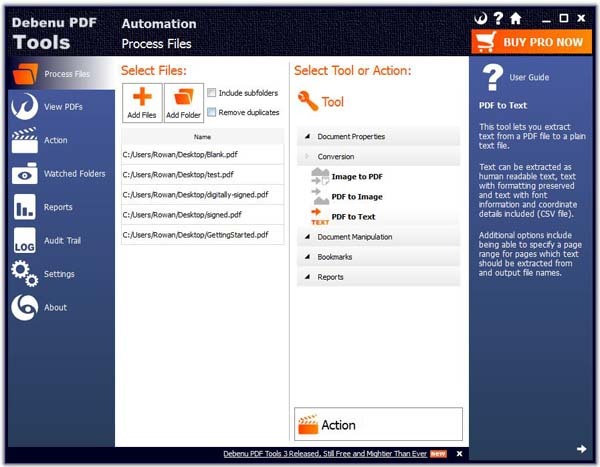 Simply launch Debenu PDF Tools Automation from the Desktop shortcut and click on the Process Files tab, then add the files that you want to process and the tool that you want to use to process them with and bang all of the selected files will be processed. It makes processing large numbers of documents really easy. Ever wanted to sit back and relax while someone else did the grunt work of your PDF workflow? Well, that’s now possible with another great new feature in version 3 of Debenu PDF Tools: Watched Folders. 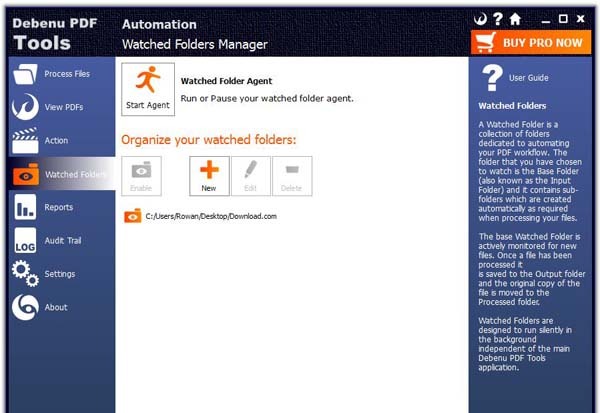 Click on the Debenu PDF Tools Automation shortcut on your Desktop and then click on the Watched Folders tab. With four different ways of using it we think that Debenu PDF Tools is a powerful free utility for Windows users. 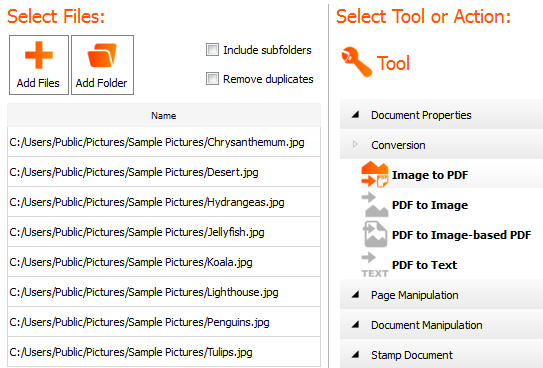 Editing the properties (or metadata) of PDF files is easy using Debenu PDF Tools. Simply right-click on a PDF and select ‘Debenu PDF Tools > Edit > Document Properties > Edit Document Metadata’from the Windows Explorer context-menu. A window will open up that allows you to directly edit the properties for PDF files without having to open the PDF. Edit the Title, Author, Subject and Keywords with ease. Alternatively you can access this functionality through the Debenu PDF Tools application or through Debenu PDF Tools Automation for batch processing. When you click on the Debenu PDF Tools > Edit > Document Properties > Initial Viewoption a window will open up that allows you to directly edit the initial view for the selected PDF without having to open the PDF. Sometimes you need to separate a PDF document into separate parts. That’s called splitting, but it can also be called extracting or bursting. Debenu PDF Tools lets you split PDF files by npages or a page range and split PDF files by bookmark levels. 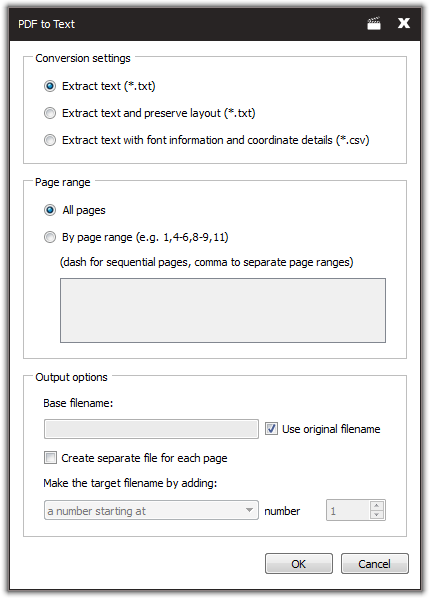 It’s easy to split PDF files by page chunks or by page ranges. A page chunk would be split a PDF file every 100 pages or every 10 pages or even every page. 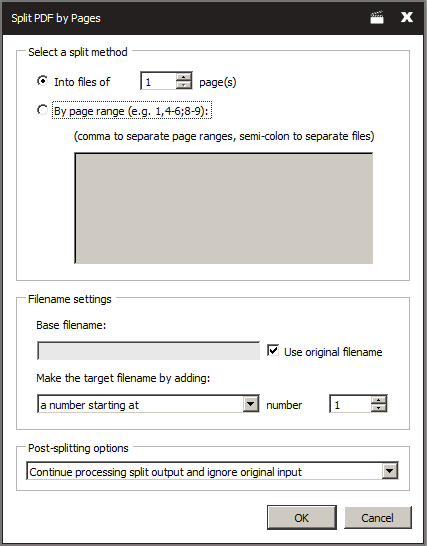 Alternatively, using a page range, you should specify with a lot more precision exactly which pages you want to split into a new PDF. A PDF can contain bookmarks which help you navigate around the document. Bookmarks are often used like a traditional table of contents. 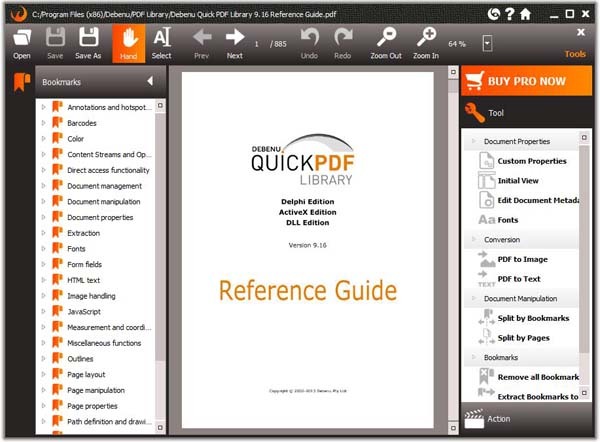 Debenu PDF Tools lets you split PDF files based on bookmark levels. So just so that you want to split the PDF by all top-line (or ‘parent’) bookmarks. You can do this by changing the settings so that it splits by bookmark levels 1 to 1. 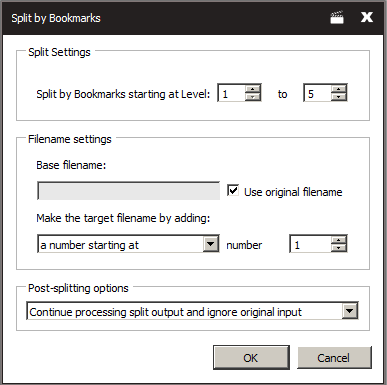 But if you want to split by all bookmarks in the PDF you would choose split by bookmark levels 1 to 5 (PDF files don’t generally have more than five levels of bookmarks). Merging multiple PDF files together is easy. Simply right-click on two or more PDFs and select ‘Debenu PDF Tools > Combine > Combine selected files’from the Windows Explorer context-menu. A window will then open that lists the PDFs you have selected. Just choose the order in which you want the PDF files to be merged and click OK.
To convert an image to PDF right-click on the image and select ‘Debenu PDF Tools > Conversion > Image to PDF’from the Windows Explorer context-menu. The image will instantly be converted to PDF and the resulting file will be placed in the same directory that the image is located in. Support image file types are BMP, TIFF, JPEG, PNG, GIF, WMF and EMF. The screenshot above demonstrates that you can easily right-click on an image and convert it to PDF. Down below we demonstrate how to batch convert images to PDF. To batch convert images click on the Debenu PDF Tools Automationshortcut on the Windows Desktop and then click on the Process Filestab and add the files that you want to process and then select and double-click on the Image to PDFtool to run it. Like all features in Debenu PDF Tools, this feature can be accessed via Windows Explorer or through the GUI application for Debenu PDF Tools. To convert an PDF to a collection of images right-click on the image and select ‘Debenu PDF Tools > Conversion > PDF to Image’from the Windows Explorer context-menu. Each page of the PDF will be converted to a separate JPEG file. These JPG files will be stored in a folder with the same name as the source file. To convert a PDF to text right-click on the PDF and select ‘Debenu PDF Tools > Conversion > PDF to Text’from the Windows Explorer context-menu. The PDF will be converted to text and the resulting file will be stored as a text file (.txt) in the same folder.